Blend all the above without the Olive oil. Once the veggies are blended, slowly strain the oil in till the mixture looks shiny and well blended. Chill for atleast 3-4 hrs before serving. Garnish with mint leaves before serving. Watermelon and blue cheese salad! 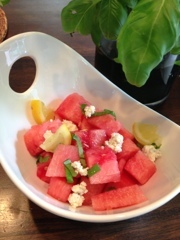 Watermelon, lemon, basil salad tossed with sea salt, fresh cracked pepper and crumbly blue cheese. Sweet, salty and tangy! You will love these so much, you may never think of eating them any other way!! Dip the tomato slices in the first bowl of flour and shake off the excess. Make sure all the tomatoes are coated on both sides. Heat about 1/4 cup of canola/vegetable oil on high heat for about 2-3 minutes. Fry the tomatoes in the oil for 2-3 minutes on each side till a light golden brown. Drain on paper towels. Fold all the above and let rest in the fridge for atleast 1 hr in the fridge. Cha Ching!! 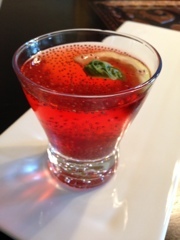 Chia summer cooler! Yes, I am having way too much fun with my Chia seeds! 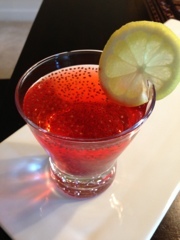 Try my Chia summer cooler today! You will love it!! Mix all the above and chill for atleast 30 minutes!! 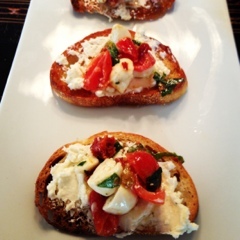 Try adding the lemon rind and some fresh basil for a refreshing twist! 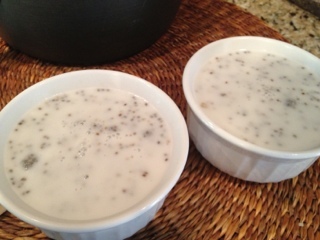 Growing up in India, Sabja (Chia seeds) were a summer staple. Known for their high fibre content, they are not only filling but can hold water upto 10 times their weight so they are great for hydration. Perfect for a snack before working out and all in all, a summer essential. You can add Chia seeds to smoothies, juices, yogurt and even lentils! The best way to consume Chia seeds in my opinion is in a summer cooler! Recipe up soon! 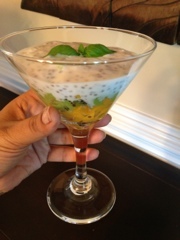 However, Chia breakfast pudding is the most popular recipe you’ll see out there in the recipe world. 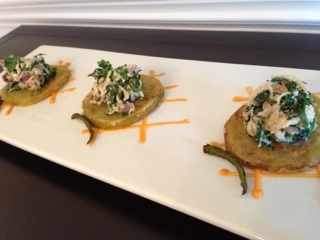 My recipe below is my humble homage to this ancient powerhouse. Hope you all enjoy it! 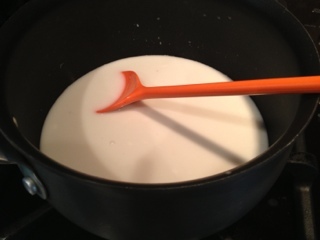 Bring the coconut milk to a boiling point and add the sugar. 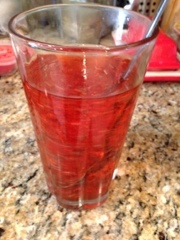 Dissolve the sugar completely on low heat and take it off from the stove top. 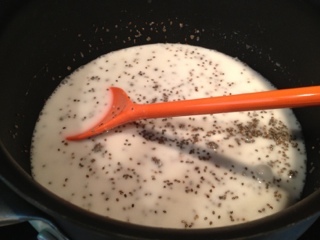 Add the seeds in the coconut milk mixture and add the basil leaves. Pour in serving dishes and let chill overnight. 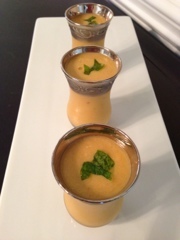 Serve with chopped up mangoes, kiwis and pineapples. 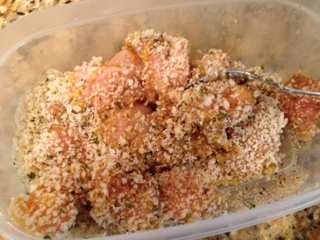 Parmesan and chicken pop bites! 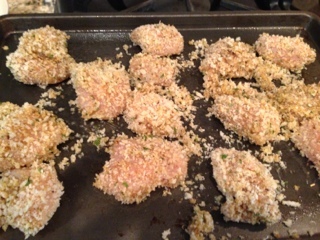 Mix the “Crumb Mixture” ingredients and drop the chicken in it. Gently toss to coat well. 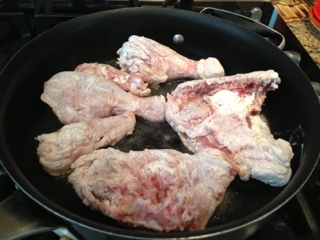 Lay the chicken in a single layer in a greased cookie sheet. 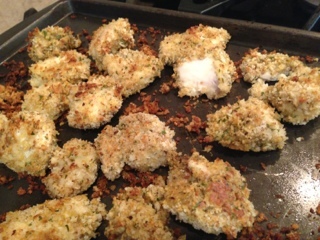 Pop it in a preheated oven at 375 degrees for 12-15 minutes. Toss the pieces midway to cook all sides. Cut a couple of pieces. 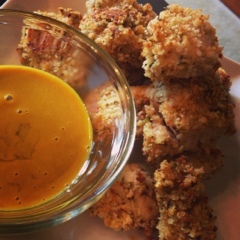 Serve with home made Maple Mustard ( 5 Tbsp Yellow Mustard and 2 Tbsp Maple syrup) sauce! 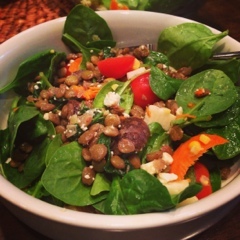 Warm lentils and spinach salad! Sautee garlic, mushrooms and onions in 2 Tbsps of Olive oil on medium heat till the onions and mushrooms wilt. 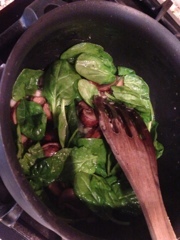 Add the spinach and cook some more till the leaves wilt. Season using salt and pepper. 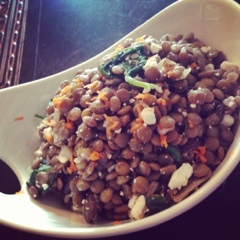 Add the lentils and toss the mixture. Remove from the stove top. Add the lime juice and feta. Gently fold the salad and serve warm (or chilled). 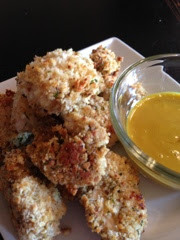 Dredge pieces of chicken in seasoned flour (1 cup of all purpose flour, salt and black pepper to taste). Shake off the excess flour. 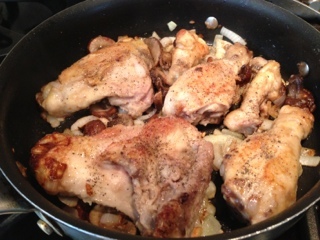 Sear the chicken in a single layer in 2-3 Tbsp of heated Olive oil. 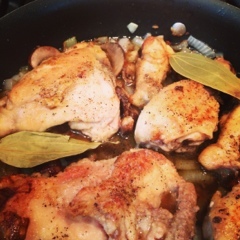 Don’t crowd the chicken in the pan. Cook for about 4-5 min on each side on medium to high heat. Add 1/2 a cup of sliced sweet onions and 2-3 cloves of garlic to the pan. Toss everything well. Continue cooking for another 5-7 minutes till the onions turn pale. Add 1 cup of sliced mushrooms of your choice. 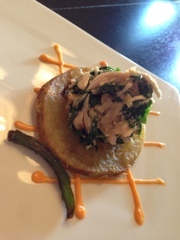 I used baby bella to add some depth to the dish. Toss everything well. Continue cooking for another 5-7 minutes. Add a couple of bayleaves and 1/2 cup of sweet marsala wine. Season with salt, black pepper and red chili flakes. Cover and let simmer for 18-20 minutes on low- medium heat. 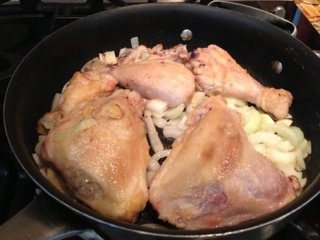 Toss the chicken in the sauce in between and continue cooking till the chicken is cooked all the way through..